* rpt from * to * to last dc, work 2tr into last dc. Turn. Rpt Pattern Rows 1 & 2 twenty two more times, followed by Pattern Row 1 once making 26 rows in all or work measures approx 9 Inches from beginning. Turn. Fasten off on first piece only. Edging - Working through both pieces of potholder throughout and using 4.50mm hook, make 1ch, 2dc into base of 1ch, 1dc into each dc and tr to 3ch to turn with, 3dc into top of 3ch, working into row ends down first side of potholder, work 38dc evenly along to next corner, 3dc into corner, 1dc into each ch along cast on edge to corner, 3dc into corner, working into row ends up second side of potholder, work 38dc evenly along to next corner, 1dc into corner, ss to first dc. Turn. Next Row - 1ch, 2dc into base of 1ch, 1dc into each dc around all four sides of potholder, working 3dc into corners, ss to first dc. Turn. rpt from * to * around all remaining sides, ss to first dc. Fasten off. 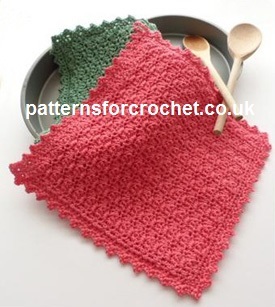 Hope you enjoy this free crochet pattern for simple potholder.